The 'Agents of Change' documentary has been in the works since 2009 through Khazi Plant Productions, with its final two weeks of filming commencing in South Africa on 29 November. The crew’s journey has been facilitated by Project COLORS International in an effort to positively promote volunteerism on the Garden Route. 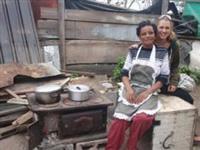 An international documentary depicts seven ‘Agents of Change’, individuals who use their daily lives to uplift their struggling communities on the Garden Route of South Africa. Sustainable volunteerism sounds like an oxymoron to most people, but these individuals featured in the International Agents of Change documentary are working daily as caregivers, soup kitchen coordinators, foster home mothers, community development officers and ambulance assistances… everyday, if they get paid or not. Why? Because they all have something in common; a passion, a dream, a love for their communities and a drive to relieve poverty in anyway they can as they know a secret that most of us don’t. The secret is the principle conviction that ‘one person can truly make a difference’. The 'Agents of Change' documentary has been in the works since 2009 through Khazi Plant Productions, with its final two weeks of filming commencing here in South Africa on 29 November. The crew’s journey has been facilitated by Project COLORS International in an effort to positively promote volunteerism on the Garden Route. For more information, visit www.projectcolors.com. Producer, Ali Barnim, and Director of Photography, Cam Erais, have been not only documenting these amazing works here in South Africa, but also volunteering their time at each project so they can help support the endeavors of these amazing people and projects. Assisting with foster home/ soup kitchen renovations, garden/ compost creation, child sponsorship planning, crèche playground renovations, weekly crèche teaching plus an upcoming camp for disadvantaged preteens in Thembalatu which is planned for 27 November in Klainkrantz. Agents of Change Producer, Ali Barnim on [email protected] or 082 502 2333.